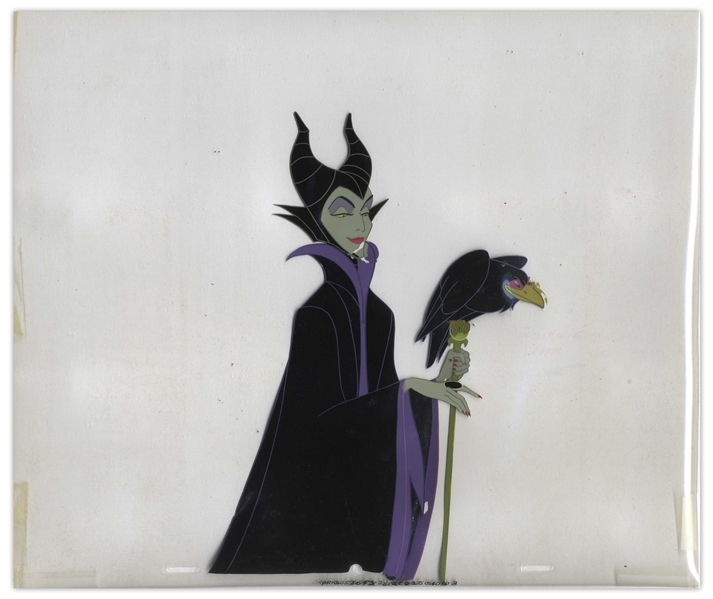 Disney animation cels of Maleficent and her raven Diablo from the 1959 film ''Sleeping Beauty''. Three levels of cels from bottom to top include: Maleficent's left hand, with draping sleeve, holding the staff; Diablo; Maleficient's face and body. Artwork measures approximately 7'' x 9.25'' on 14'' x 12'' sheets. With production numbering at bottom. Some chipping near neck, and cracking to Diablo and sleeve of gown on bottom layer, overall very good condition. Given directly to consignor by Disney animator Jim Tanaka in the early 1970s.